06.13.08 In honor of Father's Day we've collected some observations, reflections and perspectives from dads and about dads. Thanks Dad, and Happy Father's Day! As I entered my father's quarters, the scene that greeted my eyes at once aroused my interest. In the center of the room sat my father, his head cupped in the palms of his hands, his eyes staring intently at the table. Opposite him sat a brother officer, in the same attitude. Both seemed to be thinking deeply. Neither uttered a word. I approached closer, and obtained my first view of a chess-board. Without disturbing the silence that prevailed, I took a position at the table, where I could view the proceedings comfortably. My boyish curiosity soon grew to wonder; and very shortly, after observing how my father was moving those peculiarly shaped figures from square to square of the board, I felt a sudden fascination for the game. There are few things in life that can make a person feel better than passing on skills and knowledge to a child. As the father of three sons, I'm quite proud to know that at least two of them are as thrilled with the game of chess as their Dad. The third is beginning to show some interest. Sadly, there is a tremendous shortage of chess clubs in the local schools where children can learn and develop their chess skills. So, three years ago I approached the principal at the elementary school where our sons attend school and asked for permission to start a chess club. She was absolutely thrilled to offer us the opportunity to start a club. I did not have the slightest idea how to go about starting a club -- but simply having the opportunity was enough to get me started. I expected to have maybe a dozen kids sign up for the chess club. Imagine my surprise when more than 40 kids signed up -- most of whom had no idea how to play the game. Now, three years later, many of those kids are tremendous chess players and many of them have taken home trophies from local tournaments. They are the bright future of the game of chess. Dad claimed to have learned the game before his third birthday, which would probably be some kind of record. However, he admitted that he didn't acquire any real strength until his teens. This coincides with what his father told me about their last game together. Grandpa had been able to keep the upper hand against Dad for some years, but by the time Dad was fifteen, it was clear that those days were over. Dad was now winning routinely, and seemingly with little effort. Grandpa decided that, before he bowed to the inevitable, he would challenge Dad to one final game, and was going to concentrate fully on it. Play proceeded, and they reached a complex middlegame. Grandpa took a great deal of time on his moves, while Dad moved more quickly. While waiting for Grandpa to move, Dad decided to read the newspaper. Grandpa searched and found that if he made a subtle and trappy move, Dad, with his attentions elsewhere, would probably fall into it. Grandpa made his move. Dad glanced at the board and made the move Grandpa had been hoping for. With a triumphant flourish (and probably a stifled "Aha! "), Grandpa pounced. Dad looked away from the newspaper, looked at the board, and said apologetically, "Oh, father, you shouldn't have made that move. It allows mate in seven. Let me show you." From then on Grandpa found other opponents, because he knew that Dad was out of his league. Dad's greatest achievements, in terms of playing, happened several years before I learned the game, so I wasn't able to fully appreciate them. It never occurred to me to swagger among my fellow 2nd-graders and boast, "My Dad's the Michigan chess champion!" No, the only indications Roger and I had about Dad's accomplishments would be when we would wake up on a Monday morning, and we'd see a brand new trophy sitting on top of the dining room table. "Wow!" we'd say, and we'd gawk at it a while; then, if it was summer, we'd go outside to play, forgetting about the trophy until the next one came along. I remember a nice blue trophy with (what I later learned was) a queen on top; an even taller red trophy with (ditto) a king on top; but nothing could match the day when before our eyes stood a gigantic golden trophy with a big wooden base, four thick pillars, a majestic bowl-shaped object, and a figurine on top holding a feathered wreath. It was magnificent. We must have gawked three times as long for that one. The only other trophy that has made it unscathed through all the years and all the moves, and even through a pair of fires, is the Michigan Open championship trophy from 1971. We keep it proudly at my home. My Dad and I used to play chess all the time when we were little; of course, I never beat him, but the last times we played I could win maybe 10-20% of the time. Playing chess with him is one of the things I miss most. 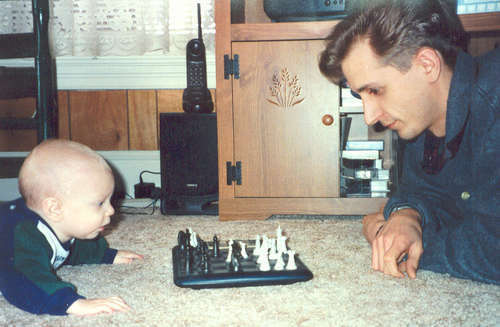 It's my Dad who taught me chess at the age of 5. I was quite happy my Dad spent so much time with me and I loved the game, as he would give me little gifts (chocolates, etc) when I answered his questions and solved his problems correctly. I was very happy to make my Dad proud of me! Every Thanksgiving morning since I was a little boy, my dad and I would play chess. He never let me beat him. Rather, he just continued to teach me chess strategy while I was growing up, knowing that one day I would become a good chess player myself. It's interesting how he taught me the same way about life... my dad was the best example of a loving husband and father that I could ever imagine. He also taught me every thing else I learned about life... values like generosity and kindness, integrity in work relationships, and the importance of God in my life. My dad, Ralph Kent, Disney's keeper of the mouse, passed last year. He was an artist, a designer of uncountable products, a lover of games, a terrible punster, and a collector of mammoth proportion. 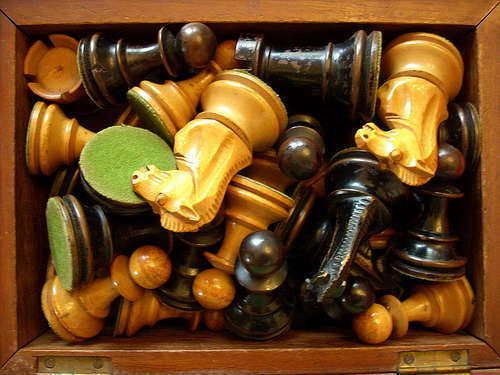 His chess set collection alone took up an entire spare bedroom. I mean stacked floor to ceiling with squeezeways to access them. He only could display maybe twenty or thirty at a time. They, along with his collections of other games (some dating to the fifteenth century), Disney memorabilia, books, and Irish pub stuff were his retirement fund. After forty-one years this Disney Legend retired in 2004. Due to severe health problems spanning the last eight years he died in 2007. My mom, left with medical and personal debts is now having to sell off some of his collection. This set, (pictured above) a basic Staunton set, was one of (my dad's) favorite playing sets. (My mom) gave it to me last week. There are chips here and there from the last 150 years of play, but it is beautifully carved, nicely weighted and feels good to hold. This set will keep Ralphee-Boy within arms reach for the rest of my life. Five of our six kids have played chess competitively at one time or another, and three are still very active (Autumn would rather be dancing). Michael is 25 now, and isn't playing much, but I taught him when he was about 10, and he played in some of Steve Wong's St. Mary's tournaments in the late 90's, and that's when I started playing competitively again. (My dad taught me when I was about 7 or 8 (1955?) and I've been a (USCF) member since the Fisher/Spassky days, playing in a few tournaments here and there.) That's about when Hoty started getting serious about playing, having learned at about age 4. He played in some of Steve's tournaments, and then started at the state scholastic tournaments. His enthusiasm inspired me and the other kids to play more. His older sisters Lily (who had been trying to eat pieces since she could crawl), and even Autumn, played a little, and then Mary and Ezra started picking it up from them as soon as they could reach for pieces. Hoty continued to play in the February and March tournaments, and Ezra started going with him in 2004 when he was 6, Mary joining in the next year at age 10. Lily played with them at home, but didn't think of playing in tournaments until Dan (DeLuca) started the girls' tournaments in 2006. She figured she could play in an all girls event, but conceded that in order to do well, she should practice in the other scholastic tournaments. She wound up 2nd that first year, and then won the girl's championship in 2007, going on to play in the Polgar tournament in Philadelphia, where I joined her to play in the U.S. Open. Mary has played in 20 tournaments, including the first two girls' events, but hasn't played for a while now - we're hoping she will return to the board soon. It was in September of 2006 that I decided to finally make good on my threat to start a chess organization in Washington County and start holding monthly tournaments, mostly so the kids could get more experience. It really was that practice that helped Lily improve to the level of state champion. Hoty meanwhile also continued to improve, and finished 4th in the state in this, his final year of high school. The enthusiasm that he carried home from his first state tournaments led him to organize a chess class with his homeschool group, and is responsible for several young players attending the states, and for the participation and success of the Maranatha scholastic teams. In 2007, Lily, Hoty, and Nathaniel Simpson took 2nd in the high school reserve team section, and this year Hoty, Nathaniel, and Ezra (at age 10) managed to turn that into a first place finish. Over the past 8 years Lily, Hoty, Mary, and Ez have played in a total of 113 tournaments. I am very, very proud of them (all six!). The Washington County Chess Federation continues to give us, and all nearby who are interested, more experience, more confidence, and more determination to stop making bad moves. No simple answers for me as I have my own three boys and then all the kids I have coached. While I coach I try to treat them as my own. I will give you just two of the things of the many that I carry with me. Of my own kids the biggest impact has been on my youngest one. I taught him the moves early. He got me into his 2nd grade class when his teacher was using chess as a teaching tool. My favorite story is when, unbeknownst to me, Ben as a 3rd grader went to the principal, Mr. Welch of Canal School in Westbrook and said we need a chess club and my Dad will coach it. I came home from work that night to find a note on my frig to call Mr. Welch about chess club. The club lasted 6 years until the new principal did not have the same interest and dedication to it. I still coach high school and Ben as a Freshman this year was my right hand man. The toughest thing in chess is going scoreless in a tournament. Yes, I did it once, and many a time I started 0-2 so I truly understand the pain. This year I had 3 kids go 0-4 in the various high school team tournaments. One of them being my son Ben, who was forced to play board one when that player could not make it due to State Jazz Festival. After his second round loss (to the player who became our individual state champion) He was very, very angry with me for making him play BD 1. This lead to some poorer play in rds 2 and 3 when he had winning positions. We stopped for dinner on the way home and had a good conversation. I reiterated my many failures at the chess board. Knowing I had failed at times seemed to help. The next day he set the board up on his own to see his games and I showed him his winning chances. I liked the fact he came right back to it and was ready to listen. The good news is he bounced back in the individuals U1200 section with two wins and two draws and a tie for 2nd place. I am very proud of him for how he handled the adversity. I had a similar experience with one of my reserve players. He was so upset by round 4 he overlooked a mate in one. I had to be a little sterner with him for his poor sportsmanship, but he came to chess club the following Wednesday and we talked about things not just chess related and turned the experience into a positive one. Overcoming adversity at the chess board can lead to positive approaches to tough situations off it. I use it as a life lesson. (I) never thought I would be a "Chessdad" - in fact I never knew there was such a thing until 3 years ago when my son Matthew took up chess it was on his own initiative, as a natural extension of his love of board games. When he realized that chess was also a sport, he was hooked. After a few tournaments, and especially after our first trip to Nationals, it suddenly became clear what a "Chessdad" (and "Chessmom") was! Chess has helped Matthew in many ways, but most importantly it has contributed enormously to his self-esteem. It also has helped teach him the direct results of hard work (and the lack of results when he doesn't work at it.) These are life lessons that have already influenced his approach to things, and which will likely stay with him always. Chessdadhood has also changed me and my wife Ilene in that it gave us an outlet for volunteerism via a scholastic chess club we set up and now run with a few other parents in our town. It has been great fun to see 15 other kids getting these benefits, and most importantly having fun together. I throughly enjoyed reading all these wonderful stories. Thank you all for your contributions to your sons and to chess.